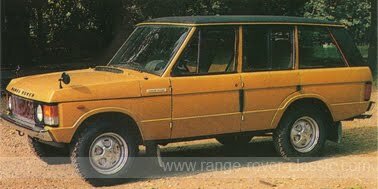 In 1972 Rover in Solihull had the first ever 4 door Range Rover prototype developed, but as the British Leyland was in completely lack of sufficient finance resources and the production of the original 2 door Range Rover could not cover the highly increased demand, any further development were not able. conversions. 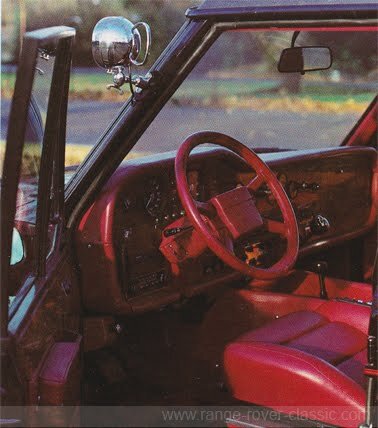 A bit crude today, but back in the 70's such window arrangement were not uncommon. 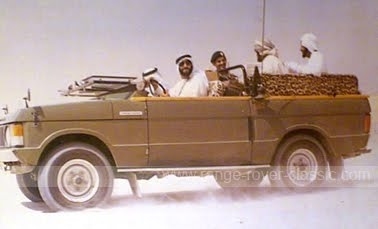 The 4 door version could be ordered in standard interior form or with high luxurious solutions, such as Recaro seats - both front and rear, special leather upholstery, air conditioning, electric windows and refrigerator for cold refreshments. so the whole window could be winded fully down. 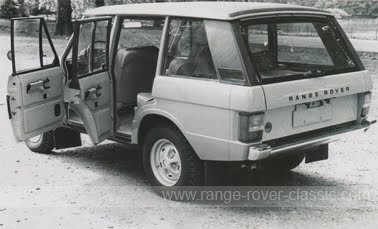 Outside the release opening handle had the same solution as the original 100" 4 door conversion. seat bases. Deep pile carpets on the floors. Any colour could be selected to customers taste. 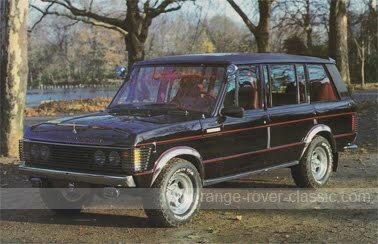 Otherwise the Ultimate could be ordered with ordinary standard Range Rover interior. 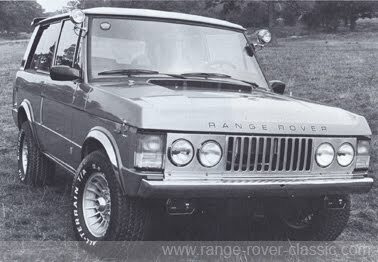 The front grille could be supplied with slatted guard in full width with wrap-around style to protect the front lights. Arab Emirates, Abu Dhabi, Oman, Saudi Arabia, to mention some. 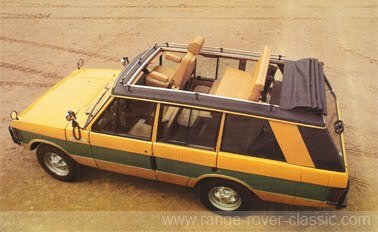 For Heads of States and other Dignitaries, a functional and distinctive vehicle. For the Sportsman, specialist equipment. 23 inches for full all-round visibility when hunting. guards, all terrain tyres, search lamps, winches, etc. proven the hard way - in the field. The slanting grille indicate a winch is ordered; either capstan or drum type. 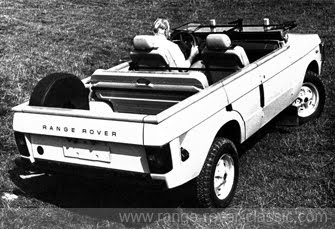 Full convertible with power operated hood. Well balanced conversion with good proportions. 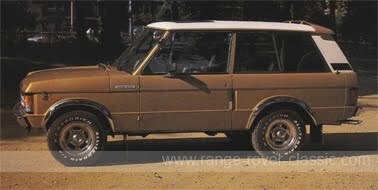 Exterior choices of individual selection of body paint, fender flares and wide all terrain tires. 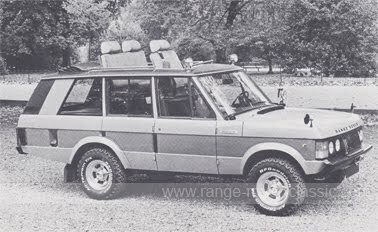 Full luggage capacity is retained as the hood is stowed on top of the body work. 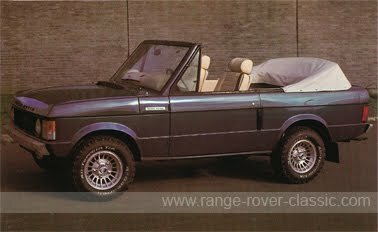 The convertible could be ordered with additional 8 inches rear overhang. Mostly standard 100 inch wheelbase length available for the FLM Panelcraft Convertible. 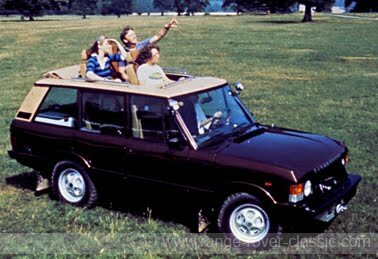 The 2 door version can seat up to 8 people; 2 in front and 6 at the rear benches. 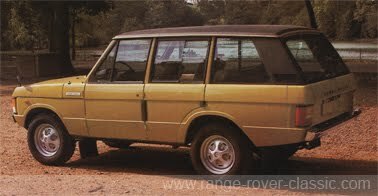 frame was delivered to these personell carrier Range Rover versions. The front screen could be folded flat by a special fixing system. 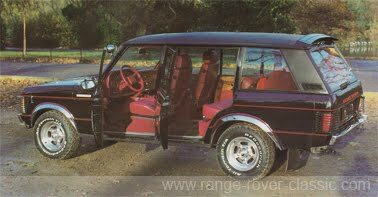 4 door fully open FLM Panelcraft conversion seen above.